You are here: Home / Credit Enhancement / Starting A Business? Build Your Credit History! Starting A Business? Build Your Credit History! Every business is full of paradoxes…. You have to give the customers something familiar, but also focus on giving them something new or different than your competition! You must be a vicious competitor, but also willing to contribute to a team. … But the most ‘paradoxical’ being… To be able to secure credit, you need to have a prior history, but to have a prior history, you need to take credit! For a new small business, the availability of appropriate and timely credit is crucial for its success in the market. Right from the initial capital investment, to the eventual requirements like purchasing machinery/equipment, hiring employees, etc, a new small business will need credit to meet its needs. Despite the schemes offered by the Government, and institutions like banks, NBFCs, and the like, one major hurdle is the business’s inability to furnish a considerable credit history. While most businesses could turn to alternative sources for initial funding like crowdsourcing and angel investors, eventually, they will need to approach more formal sources of funding. To make sure that the business is not left high and dry during desperate times, it is essential to start working on building a relevant credit history. In India, it is possible to evaluate the personal and business credit scores separately. It has been observed that the former plays an important role in the case of most underwriting models. For a new small business, the credit score of the promoter is crucially intertwined with the fortunes of the business. He/she can start by taking smaller loans and servicing them in a timely manner. Also Read: Understanding The Top Reasons Why Small Businesses Fail! If the entrepreneur is unable to get an unsecured loan, he/she can start with a secured one, for example, an auto loan or a loan backed by a guarantor. He/she must also make sure that the installments of the loan are being serviced on time. It is advisable to not go all out and take multiple loans if the entrepreneur doesn’t have the means to service them. 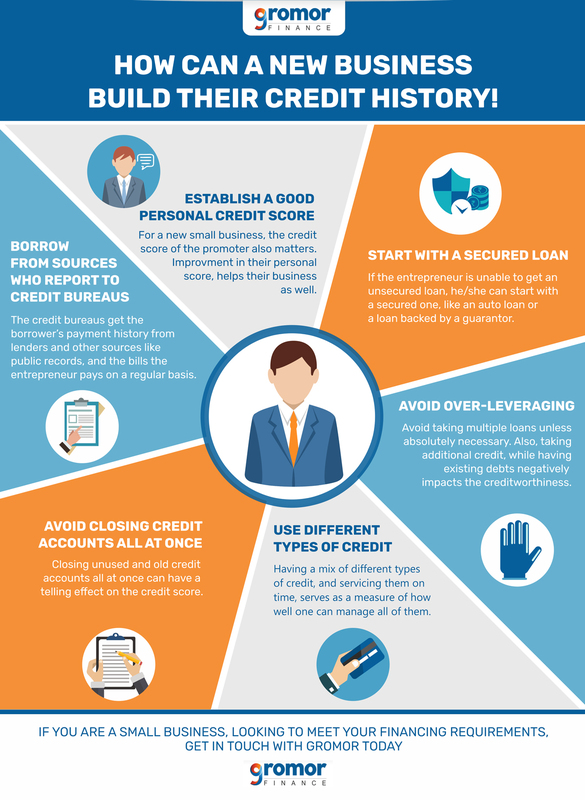 Borrowing above what the entrepreneur can afford to repay will have a negative impact on his credit score. Also, taking additional credit, while having existing debts negatively affects his creditworthiness. Having a mix of different types of credit, and servicing them on time, is beneficial to the entrepreneur’s credit score. This serves as a measure of how well he/she can manage all of them, thereby increasing the lending institution’s trust in his/her repayment abilities. Closing unused and old credit accounts is beneficial in a way since it saves a lot of unnecessary fees paid to maintain them. However, closing them all at once can have a telling effect on the credit score. Whenever an entrepreneur or a small business applies for a loan, the lenders will turn to the credit bureaus to check if he/she can repay it. To help them figure that out, they look at the entrepreneur’s history of borrowing. The credit bureaus get this information from lenders themselves, and also from other sources like public records, and the bills the entrepreneur pays on a regular basis. This way, the entrepreneur’s credit history gets registered with the credit bureau. For a small business, having a credit history, and maintaining a good credit score, is crucial to obtain finance when needed. If you are a small business looking for an unsecured business loan, get in touch with Gromor today!